Here is the first of what will probably be many posts during our three week trip away in States. We started out yesterday (14th July) in Dublin airport at 6am, after a few mandatory photos we all said our goodbyes and went to get checked in. This all went very well, everyone had remembered their passports and we checked without any problems. Next we made our way through security also without any hiccups, so far so good. After a quick stop for food and to hit the airport shops we headed downstairs to fill in customs forms, which actually turned out to cause difficulty to some members, especially when someone turned around and asked me what their country of residence was? Anyway next we lined up to get through the customs check, which went very well, everyone was finger printed and photographed. When we gathered at the other side it took a few seconds for someone to say “Where is Andrew?”. But not worry he had just gotten stuck behind a family of 6 and so it took him a little longer to get through than the rest of us. Then it was time for another security check, this time everyone had to take shoes off and computers had to be checked too. We also had two of our members randomly selected for an extra security check. While we were waiting for Daragh to be finished with his random security check I noticed on one of the boards beside us that our flight seemed to be at “Final Call”. This seemed ridiculous because we still had an hour and 10 minutes before take off. But none the less as soon as Daragh was finished we all walked very briskly down to our gate, only to be told that no it was a mistake on the board and that this should have been next to a different flight. So we sat down for a few minutes and were called to board within ten minutes or so. Once we had found our seats we spent some time swapping seats so that everyone was sitting where they wanted and beside who they wanted. The flight was very long (just under 8 hours), but everyone had there own personal tv screen on which we could choose from any number of movies, tv shows, music and games. So that kept everyone amused for the duration. Once we landed in Atlanta everyone remembered to change there watches and phones to the new time zone and we got ready for our 6 hour wait for the flight to Detroit. We didn’t even need to collect our bags to bring them through customs as everything had been pre-cleared in Dublin. So after sampling some of the many restaurants in terminal E, we made our way to terminal A. Once there we found yet more restaurants and shops and some very comfy seats. So the leaders sat down and the Scouts and Ventures went to explore and fill their stomachs. The hours actually went by fast enough, between reading, eating and playing games. Then it was time for flight number 2 which was only two hours long and I honestly slept for the duration. I think a few others did the same but same had had a few too many fizzy drinks throughout the day and so were wide awake. We made our way through Detroit airport without any difficulty apart from multiple toilet stops. 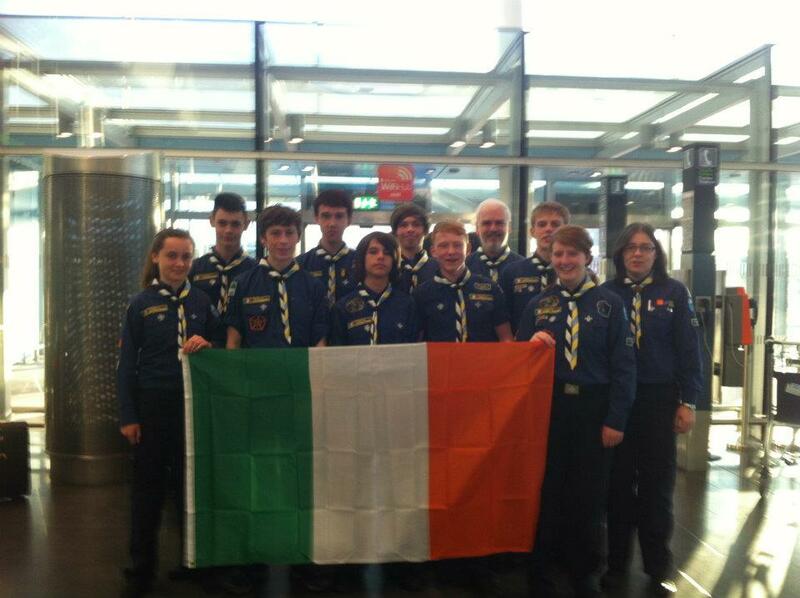 Found all of our bags and met up with John Hickling and his son Sam from our host troop. They welcomed us and then introduced us to Scott Deykes the Scout Master from the Garden City troop. We split up into the various cars that had come to collect us, and were hit with a wall of heat when we exited the airport. The Americans thought that we were funny because they actually thought it was quite cool and said that the scouts from Bonaire (a carribean island) thought it was positively freezing. We drove for about 30 minutes to a nearby Church carpark where we met up with other members of the troop and were introduced to our various host families. After some introductions and chatting myself and the two girls went with Scott who dropped us off at Dumas house were we stayed last night ( we are moving to Hodson family today). The Dumas’ family were really really nice and offered us everything from food to video games but all we really wanted was to wash and sleep! This morning we got up feeling well rested and had a really delicious breakfast. Now we are just chilling out and then Lynn (and the boys I think) are going to take us out and show us around, which should be fun. Later there is also a leaders meeting where we will be told what is planned for the rest of the week and next week. That is it for today, I will hopefully post again later today or tomorrow.